A two-minute walk from the national highway in barangay Dauis Sur is a war memorial honoring a Japanese soldier who died on that particular spot as they were fleeing the Americans from Leyte. A rectangular platform forms as base of four small obelisk-like markers etched in Kanji, the Japanese form of writing. The memorial is located on a property belonging to the parents of Ranulfo “Nocnoc” Ybañez. Now the barangay captain of Dauis Sur, Nocnoc was still 10 years old when elderly Japanese men came in 1975 to trace an incident during the war. According to the barangay captain, the Japanese soldiers sailed from Leyte to Cebu under heavy American shelling. One of them was already wounded when they landed on the shores of Dauis Sur and had to be left behind, and he died right where the memorial now stands. The grave marker has been visited by many Japanese since. 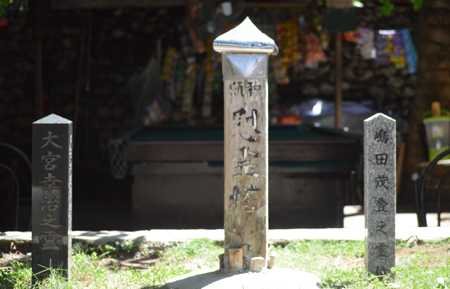 Historian and archaeologist Jobers Bersales, who sought the help of a friend in translating the writings on the marker, said that the words written on the marker honored the soldier who died --- Koji Oomiya. Oomiya died on January 31, 1945 at the age of 23.